Henry Cole Quinby, Genealogical History of the Quinby (Quimby) Family in England and America, , at https://books.google.com/books?id=3d4UAAAAYAAJ . Rutland, Vermont: The Tuttle Company, (1915) , p. 109. Richard Quimby was born perhaps about 1776. Harrison Colby, A genealogy of the descendants of Abraham Colby and Elizabeth Blaisdell, his wife, who settled in Bow in 1768, , at https://archive.org/details/genealogyofdesce00colb . Concord, N.H.: Printed by the Republican Press Association, (1895) Microfilm #896944 of the Family History Library, Salt Lake City, Utah, p. 422. New Hampshire Statewide Marriage Records 1637-1947,, Concord: New Hampshire Bureau of Vital Records and Health Statistics, , FHL Film Number: 1001295. "Massachusetts, Town Clerk, Vital and Town Records, 1626-2001," database with images, FamilySearch (https://familysearch.org/ark:/61903/1:1:Q29L-R1W8 : 13 July 2016), Edmund Quincy and Hannah Gannett, 30 Apr 1767; citing Marriage, Sharon, Norfolk, Massachusetts, United States, , town clerk offices, Massachusetts; FHL microfilm 777,850. Edward Frances Flint and Gwendolyn Slaughter Flint, Flint family history of the adventuresome seven, Vol. 2, , at https://books.google.com/books?id=L7tMAAAAMAAJ . Baltimore, Md. : Gateway Press, (1984) , p. 648. Edward Frances Flint and Gwendolyn Slaughter Flint, Flint family history of the adventuresome seven, Vol. 2, , at https://books.google.com/books?id=L7tMAAAAMAAJ . Baltimore, Md. : Gateway Press, (1984) , p. 649. Daughters of the American Revolution, Lineage Book, Vol. 5, , at https://books.google.com/books?id=qmM26SlaKSwC . (1898) , p. 158. Sons of the American Revolution. Illinois Society, Year Book of the Illinois Society of the Sons of the American Revolution, Incorporated, , at https://books.google.com/books?id=omkwAQAAMAAJ . (1896) , p. 214. Laarchee Mugrosa Quiparoch is online at https://www.facebook.com/laarchee.quiparoch. Leonard Radcliff was born perhaps about 1864. Ancestry.com. Wisconsin Marriages, pre-1907 [database on-line], Provo, UT: MyFamily.com, Inc., , pre-1907. Madison, WI, USA: Wisconsin Department of Health and Family Services Vital Records Division Original data: Wisconsin Department of Health and Family Services. Wisconsin Vital Record Index , Volume: 02, Page: 0079. "United States Census, 1900," database with images, FamilySearch (https://familysearch.org/pal:/MM9.3.1/TH-266-11127-119949-72?cc=1325221 : 5 August 2014), Minnesota > Hennepin > ED 62 Minneapolis city Ward 5 > image 5 of 34; citing NARA microfilm publication T623 (Washington, D.C.: National Archives and Records Administration, n.d.). living at 59 Fayston Street, Boston, Massachusetts. 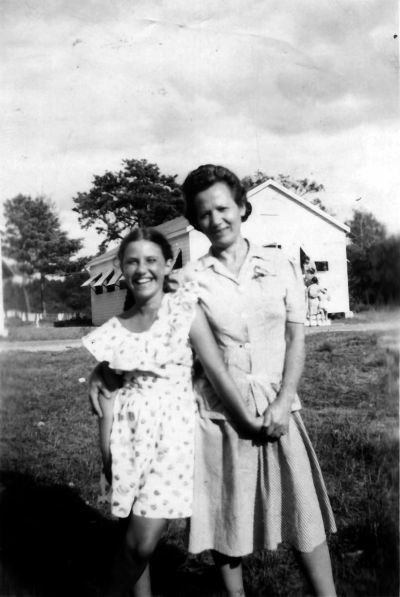 Elaine Levine and her mother, Clara (Ramler) Levine - 1946. “New Hampshire, Marriage and Divorce Records, 1659–1947.” Online index and digital images. New England Historical Genealogical Society. Citing New Hampshire Bureau of Vital Records, Concord, New Hampshire. Record of marriage of Marcia Tilda Levine. 1930 United States. Bureau of the Census. 15th census, United States, 1930 federal census : population schedules ; NARA microfilm publication T626, Washington, District of Columbia: Bureau of the Census Micro-Film Laboratory, ([19--?]) , Census Place: Boston, Suffolk, Massachusetts; Roll: 951; Page: 2B; Enumeration District: 396; Image: 1016.0. Sixteenth Census of the United States, 1940, Washington, D.C.: National Archives and Records Administration, (1940) , Census Place: Boston, Suffolk, Massachusetts; Roll: T627_1672; Page: 2B; Enumeration District: 15-487. Hattie L. Ramsdell was born perhaps about 1850. Florence Osgood Rand, A Genealogy of the Rand Family in the United States, , at https://books.google.com/books?id=LFJJAAAAYAAJ . New York: The Republic Press, (1898) , p. 176. 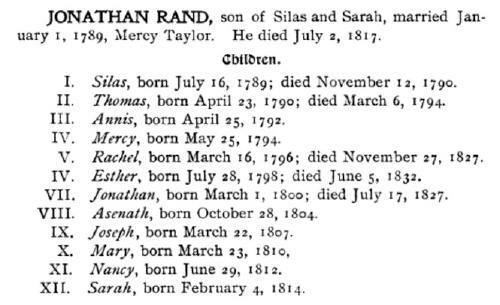 "Massachusetts Deaths, 1841-1915," database with images, FamilySearch (https://familysearch.org/ark:/61903/1:1:NWFN-SBC : 10 December 2014), Susan Whitcomb Peckham, 02 Nov 1903; citing Worcester, Massachusetts, v 60 cn 115, State Archives, Boston; FHL microfilm 2,069,264. 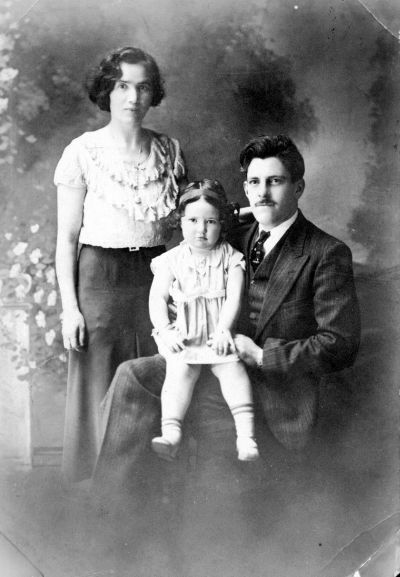 Florence Osgood Rand, A Genealogy of the Rand Family in the United States, , at https://books.google.com/books?id=LFJJAAAAYAAJ . New York: The Republic Press, (1898) , p. 175. Thomas W. Baldwin, Vital records of Harvard, Massachusetts to the year 1850, Boston: Wright & Potter, (1917) , p. 85. Florence Osgood Rand, A Genealogy of the Rand Family in the United States, , at https://books.google.com/books?id=LFJJAAAAYAAJ . New York: The Republic Press, (1898) , p. 174. 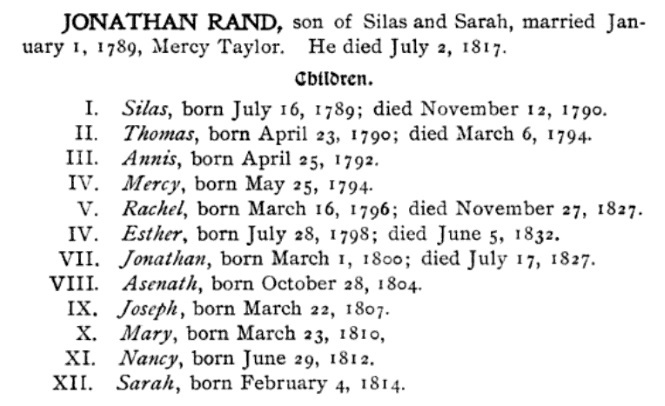 Thomas W. Baldwin, Vital records of Harvard, Massachusetts to the year 1850, Boston: Wright & Potter, (1917) , p. 297.